In case you didn't know, it is Law School Mental Health Day (it's also generally Mental Health Day so this applies to everyone). I think it is so great that law schools and the larger legal community are getting better about encouraging mental health in law students. Law school is so hard... it stresses you physically and emotionally. Historically, law school existed with a culture of "weed out the people who can't stand up to the challenge" and was pretty unforgiving (watch The Paper Chase on Netflix to see what I mean). I think the trend has moved in a positive direction to have more academic help available, encouraging a balance between law school and regular life and encouraging students to take care of their physical and mental wellbeing. During my own law school journey, my mental health has been at an all-time low. The stress and pressure of law school have on more than one occasion sent me into a downward spiral and I have had more panic attacks than I care to admit. I can't even count the number of times I have had an emotional breakdown in front of my husband and told him I wanted to give up on this crazy lawyer dream. If anyone ever tells you that law school is easy, they are either lying or crazy. Law school is really hard and really stressful but there are so many ways to handle it and get through it. Today, I am coming at you with a highly requested blog post on managing stress in law school (or life in general). I am not going to say I am an expert at managing stress (I am far from it), but now that I have reached my 3L year, I do think I have learned some quality coping tips. Stress in law school tends to build. I always find that when I try to ignore it, it builds up to a point where it becomes unmanageable and that's when the breakdown usually occurs. I think the key to avoiding this is finding a healthy release for your stress. It may be cooking or running or even just taking a 5-minute walk through the sunshine. Whatever it is that helps you to burn off a little bit of the stress, do it often. My ultimate release from stress is going to the barn and spending time with my horses but I cannot do that as often as I would like because I live an hour away. When I can't make it to the barn, I love to bake my troubles away, do a short yoga flow, go for a walk with my puppies or meditate with Headspace. The healthier you can keep your body, the easier it will be for you to handle stress. Being stressed in law school is not an excuse to let your physical wellbeing down. Get enough rest and sleep; being exhausted will only push you closer to a mental breakdown. Your body needs time to recover from stressful events so take an hour to relax after a hard class or an exam. Don't rely on alcohol, drugs, or compulsive behaviors to reduce stress- that will just lead you to more problems long term. Try to eat healthily and fuel your body for success... though there is nothing wrong with some chocolate after a rough day. Exercise often; the endorphins are great, it will make you stronger and it doubles as stress relief/release. Law school carries plenty of its own stress so to cut down on the stress in your life, eliminate as many unnecessary stressors as possible. Do you have a friend in constant crisis that causes you secondary stress? Maybe limit your contact with that person during the semester. Does living in a dirty apartment cause you stress? Keep it clean. The more little unnecessary stressors you can eliminate, the better. For me, this meant cutting a few toxic friendships out of my life. They were stressing me out and I was getting nothing positive out of the situation. It can be easy to work yourself to death during law school. There is always something more to do, read or study. However, that will only lead to burnout. When your body needs rest, you have to give in. Personally, there are some days that I choose to skip reading for class in favor of getting two extra hours of sleep. These are rare occasions but sometimes I just need the rest. You may think this is repetitive but I promise it is not. Stress release and relaxing are two different things for me. Sometimes I need to go for a walk to burn off the extra stress- this is a release. Other times I need to curl up on the couch with a cup of hot tea and a Hallmark movie and let my mind and body fully relax. I try to do this at least one night a week; I turn off my "lawyer" brain and just let myself be a lazy couch potato for a few hours. 6. Accept that there are events that you cannot control. There are going to be a lot of things that stress you out that you have no control over. Accept it. If you can't control it, there is no use stressing about it and letting it weigh on your mental wellbeing. I have mentioned a few times not to push yourself so hard that you get burnt out. To do this, you need to learn what your limits are and stick to them. I know that I can only do about 4 or 5 days in a row with less than 6 hours of sleep before I will have a breakdown. Figure out your limits and stay within them. I think this might be my favorite piece of advice. Find yourself a tribe of supportive friends and rely on them when the going gets tough. I have a wonderful group of friends in law school that I can fall back on for support when I need it. I also have a wonderfully supportive husband and family. Surround yourself with good people that will be there for you when things get rough. If you do not have friends and family to fall back on, there is absolutely nothing wrong with seeking treatment with a psychologist or other mental health professional trained in stress management or biofeedback techniques to learn healthy ways of dealing with the stress in your life. 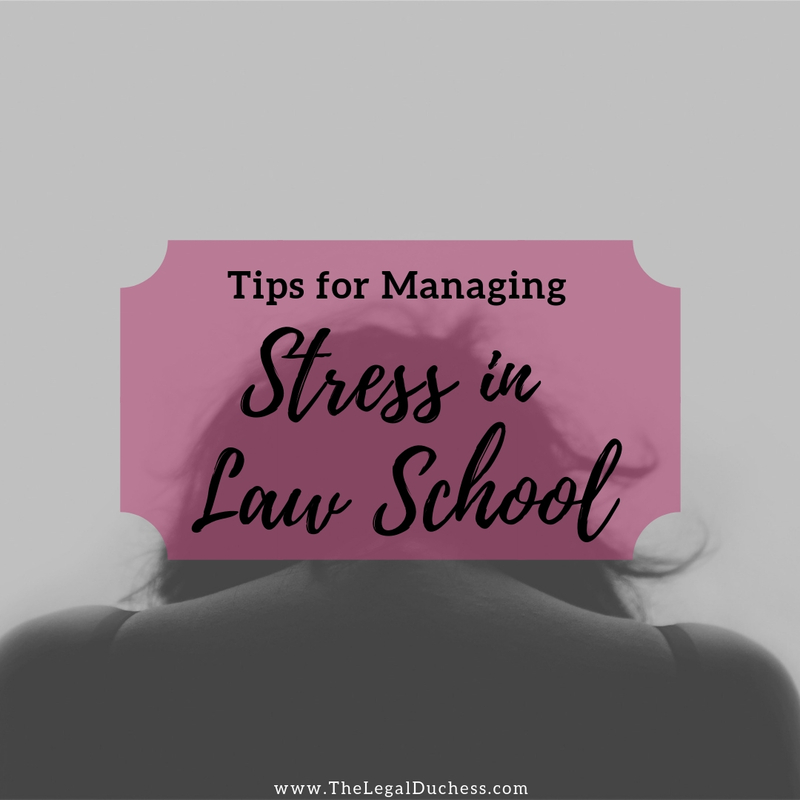 Law school is hard and stressful but there are ways to manage it. I hope this is helpful but remember- everyone is different and what works for me may not work for you. Stress can be managed; you just have to find a course of action that works for you.